Watercolored a rainbow; added a sentiment from Right at Home. Speckled colors from the rainbow into the sky. Used Tombow Markers and watercolor paper. MOOD WHEN DONE = Great! I'm taking a page from Chaitali Narla (so talented and such a sweet person! ), and changing the way I blog. I'll be spending less time writing up the posts -- fewer product names and links, and using my phone for taking pictures. Ask if you have any questions about products, etc. But I'll still be writing stories when the muse strikes! Thanks! Wow that's awesome you are finding this technique useful too! Your cards are beautiful as usual!!! Love this card and I love that you are trying something new with your blog. I hope your day is lovely. 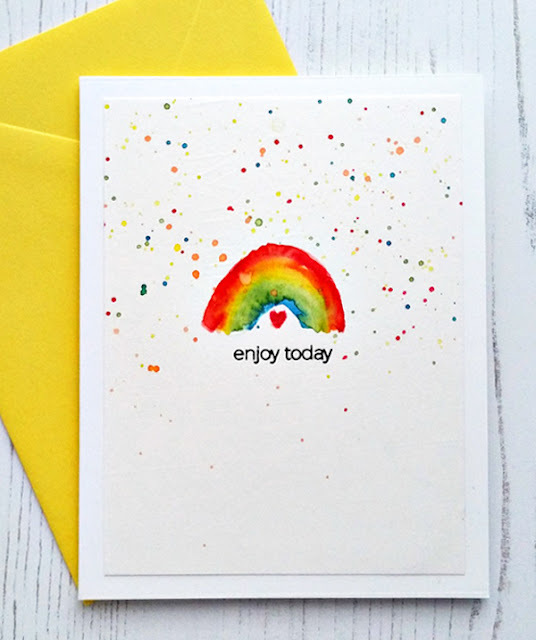 A cute watercolored rainbow with a rainbow-speckled sky! Love that little heart underneath. I'll visit here and admire your cards no matter how you blog them. I love when I make a relatively CAS card because it's so easy to explain. For me it's easier to list products and do at least a simple explanation than to answer all the emails, and I do get emails if I don't explain. Sheesh, here I am talking again when I could be stamping... don't have time for that today, either, though. Life. I love your blog no matter what you post and visiting it is always a high point in my day. I'm just happy that you're feeling well enough again to create and to blog. I have a cranky pacemaker (not a defib) and I've followed your journey with interest. Thank you for always making my day a little bit nicer. I love your blogging idea Joan. I paid to have a blog template created for me in 2012! I have never posted a thing. I see what others do and think I just DON'T have time for that. I have a blog about our boat and I kept it up for one trip. I know how much work it is. I work 50 plus hours and commute an hour each way. Summer weekends are spent on the boat and I always thought I want to; I just can't. But, maybe, just maybe I could at least post a few favorite cards and keep the chat and product acknowledgement to the absolute minimum. Thanks for your lovely cards as always and the inspiration.